Webdesign that reflects the spirit of your business and is a pleasure for your visitors to use. Make your site interactive, for example with e-commerce, bookings or integration with your existing applications. Have your site hosted by us, under your own domain name. Barranrioch Farm bed & breakfast. 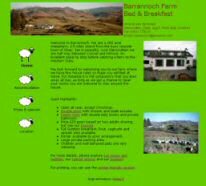 This is a sheep farm just outside of Oban offering B&B. The website captures the relaxed, child- and pet friendly atmosphere. For the visitor, all relevant information is conveniently summarised on the home page, with a printer friendly version available. Browsing further, the visitor is sure to remember the cute sheep used for navigation. 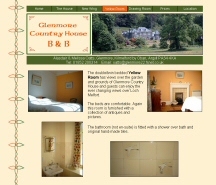 In a country house set in its own grounds and with many interesting architectural features, Glenmore offers three comfortable bedrooms. The website gives a good impression of the natural beauty of the surroundings combined with the comfort of a splendid country house. A photo gallery and a printer-friendly page are also provided.